Shakespeare played out-of-doors is a time-honoured tradition, and especially appropriate for plays set in nature, such as Rosalynde (or, As You Like It). The main setting is the Forest of Arden, where a number of people have fled to avoid persecution at the hands of an evil Duke. Driftwood‘s production is a “Bard’s Bus Tour”, playing in various municipalities around Southern Ontario, with a vision to provide quality Shakespearean theatre to people of varying locations and income levels — all shows are either free or Pay What You Can. Driftwood does provide a quality experience, with skilled performances winning my attention over many distractions on the evening I attended. One of the drawbacks of doing plays for people who don’t usually go to theatre is that your audience doesn’t necessarily understand the etiquette. When I attended, there was a row of people behind us who talked during the performance. I’m a person who is very conflict-avoidant with strangers, but after many looks, and then glares, were ignored I did have to shush them. So did my companion, a separate time. The many children were less of a distraction. They seemed to have an inherent understanding that if they couldn’t pay attention, they could run away and play and then come back later. In fact, I was very pleased by the number of children who did come back, and were paying rapt attention at the end. One thing that may have drawn them in is Driftwood’s use of puppets. The puppets help make it a family friendly show and underline the comedy of the piece, most effectively in an early scene where Orlando (Ngabo Nabea) has a wrestling match with the monstrous Charles (Megan Miles) a puppet who towers over him, yet is thrown into pieces by a mighty blow Orlando lands. The crux of the plot is that Orlando and Rosalynde (Sochi Fried) are in love-at-first-sight, but the second time they meet she is dressed as a man, because she and her beloved cousin Celia (Ximena Huizi) are on the run and feel it’s dangerous for two women alone on the road. Rosalynde meets Orlando under her assumed identity and decides to play a game, claiming she can cure him of love if he courts her as if she were Rosalynde (who she actually is). Such absurdity runs throughout: for example, the play is set in France but at one point Orlando is wounded by a lioness. The ludicrousness of the play as-written gives free license for companies to get imaginative with staging. Driftwood has decided to stage this in the Prohibition era, which works wonderfully for the wrestling match, which is now an underground gambling venture, and for the exiled Duke (Eric Woolfe plays both Dukes) to have a moonshine still in the forest. It worked less for me when they interpolated texts such as suffragette tracts into the transitions. I understand that they were, in this example, trying to draw a connection between Rosalynde as a woman who breaks gender boundaries and turn-of-the-century feminists, but it felt awkward, shoe-horned in. Conversely, a few little asides, such as when Celia said something like “But I just set up the backyard,” as a transition began, were charming and flowed well with the action. The show runs for two and a half hours, which turned out to be a little long for my forty-years-old body to sit on the ground, despite owning a colourful and waterproof picnic blanket. But there isn’t much you’d want to cut — the least relevant characters to the plot are also two of the most delightful. Touchstone, the Fool, is played by Geoffrey Armour as a high camp clown, adept at a physical joke, engaging for the kiddie crowd, and ambiguous in his sexuality as he courts the puppet country girl Audrey (also Megan Miles, a true master of puppets). The character of Jaques does nothing but mope around the woods making philosophical declarations, but he has one of the most famous speeches in all of Shakespeare: “All the world’s a stage…” In Driftwood’s production, Jaques is a woman who has recently returned from being a fighter pilot in the first world war, played by Caroline Gillis with world-weary cynicism befitting the character. 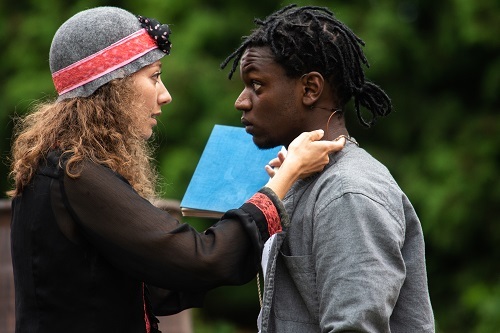 There are a number of opportunities to witness this version of Rosalynde (or, As You Like It), some in the GTA and others in places such as Marmora and Napanee. If you live in these places or know someone who does, it’s a great way to spend an evening with your children, your picnic baskets and your camping chairs.